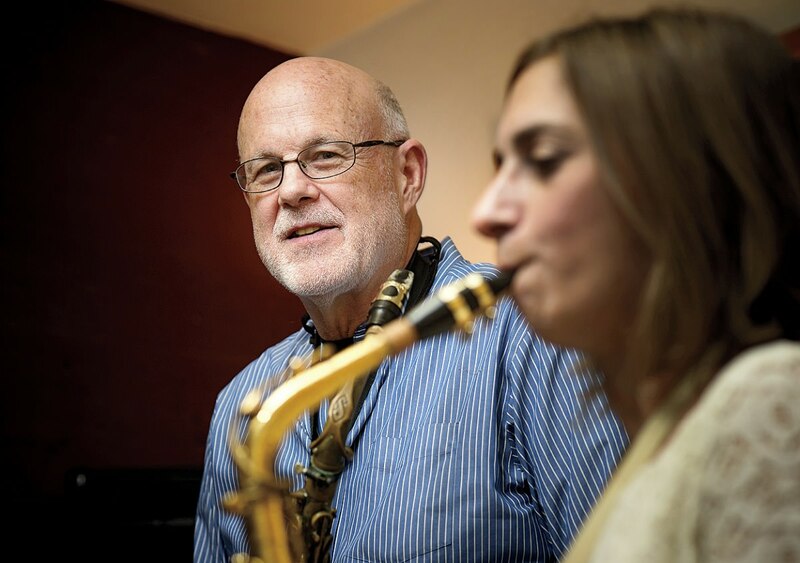 John Payne teaches a saxophone student at his music center in Brookline, Massachusetts. The answer was to start a different kind of music school, the John Payne Music Center (JPMC), now a nonprofit. Operating at a limited skill level was, he knew, no barrier to musical pleasure. Despite having played with Van Morrison (on the celebrated Astral Weeks album, among others), Phoebe Snow, and Bonnie Raitt ’72 (on her Give It Up album), and appearing on NBC’s Tonight Show and Saturday Night Live, Payne realized that “Some of the greatest times I’ve had came when I was no good at all”—like playing a small, plastic end-blown flute called a Tonette as a fourth-grader, where “the level of musicianship of the group was very, very basic, to put it as delicately as possible.” He adds, “Enjoyment is not proportional to how good you are. The value of music comes in the joy you take from it, and give to others.” In an essay, “Reversing the Dwindling Spiral of Musical Enjoyment” (see his entry under “Teachers” at www.jpmc.us), and at his school in Brookline, Massachusetts, Payne rejects what he calls “the tyranny of competence,” noting that the first question people often ask when they learn that someone plays an instrument is, “Is she any good?” Payne suggests that “Is she having fun with it?” might be more appropriate.